I have made a proof-of-concept which uses hscript together with luxe and the new automatic reloading functionality to provide a very quick way of tweaking entity behavior. With some workarounds which I have provided, I think this is a viable way doing prototyping. A big bonus with my solution is that scripts will behave as a normal Haxe-files. This makes the default code completion work out-of-the-box for most IDE's / text editors - which I think is absolutely necessary when scripting. Check out the code and a bloated animated gif or even play a web version! Code completion in IDE's have to work like normal! (I currently use Sublime Text 3). A working snowkit / luxe setup (see guide here). Since we are using the reloading functionality - only Windows, Mac and Linux are supported. Web target should work, but will not reload. I guess the most interesting part for most people are how I utilized hscript and some of the technical issues I encountered during the implementation, so here goes! This was the first thing I set out to solve. Not having all functions in my head / fingers, it was very important that I could do "normal" completion when coding the scripts. This is also vital to avoid errors since hscript doesn't compile and doesn't have type safety. So we need to count on the Haxe completion server to help us out! Parse import statements to be able to dynamically map variables available and to help code completion. Note that hscript requires to have an explicit mapping to know about static classes / singletons like Luxe, and for instancing new types. This is done for the hscript intrepter as follows: scr_interp.variables.set('Luxe', Luxe);. Allow class statement to satisfy completion - or else it will choke completely. For specific, non-static variables, have to use self-referencing: var entity : Sprite = entity;. Note that we have to use the assignment. Remember to add extra classpaths to let the completion server register the files. In the flow file, put an extra directive for app in the flow file like this: codepaths: ['src', 'assets/scripts'] or wherever you have your script. They also have to have the .hx file extension. Even though many code completion plugins understands .hscript, the completion server does not. I wondered how to call script functions. @PDeveloper helped by pointing out that functions are variables and can be casted! Example: `` For now, expected functions are 'init' and 'ondestroy' and optionally 'update'. In general, you will lose your type safety. hscript uses reflection and doesn't really care about types. This is to some degree alleviated by subjecting the script to completion rules when coding. I don't think I would have pursued this path without proper completion as described earlier. hscript doesn't handle generics, so it will give an error on any variable declarations like new Array<String>, but it is possible to instance it like this: new Array(). First, I branched hscript to let the parser ignore import and class statements (tokens), and to fix a long-standing issues with assigning to properties. Later I decided to drop this in favor of a slightly more "hacky" solution that supports the official branch of the hscript library. Also, I had to override the interpreter similar what is described by @underscorediscovery in the hscript issue log #10. In general, the code completion topic and the extra "features" that I allow as an "extension" to hscript leads to that the file format needs to adhere to a couple of rules. (Also note that I haven't done extensive testing to find faults of the formats, please let me know if you find any border cases that breaks it). Unfortunately, debugging becomes a lot harder with scripts in general, and also when using a very callback-heavy architecture. Here I have a hard time knowing which part of the script has actually failed. This is one possible area for future improvement. The only thing I could figure out the help was the fact that I most likely do a lot of very small changes, so when something stops working, backtrace a few steps and try to locate the culprit. In many cases there are null references as a result of missing import statements in script. Also, runaway event handlers contributed to some of my bugs. These are some of the things I also encountered when resolving classes for use in the scripts. One of the early show-stoppers was the fact that Haxe can't load classes which aren't declared at compile time. Imports that are not used anywhere are by default ignored by the Haxe Dead Code Elimination (DCE). This must therefore be turned on in the flow file under the build section like this: flags: ['-dce no']. Be aware that import statements with asterisk does not work! (For example import luxe.collision.*). To easier collect all classes needed, I created a separate class to include all avaible classes to the script. This idea was borrowed from Acadnme. Another important thing to note is that Luxe uses "aliases" (typdefs) to create a consistent luxe namespace, for example typedef Vector = phoenix.Vector;. Since we and hscript use Type.resolveClass to map classes, this means that we have to use the actual class when importing, both in the scripts and in the ScriptClassLibrary class. So, instead of importing luxe.Vector, we have to use phoenix.Vector. Let's return to the core of the program and the general architecture. All core script helper classes are framework-independent and resides under the scripting source folder. The scripts should primarly control state and values of entities and components - note that I do not create or destroy any components or entities inside scripts themselves. This is of course not an absolute rule or technical limitation, but I think it makes the architecture clearer by setting some overall rules - it also helps deciding where to put some additional logic or feature. I created a script handler for ease the dealing with script loading and function calling - including catching potential errors without crashing. I created separate classes / files declaring imports to make classes available to the scripts. For convenience, I also created a luxe Component to handle scripts to be attached to entities. So here we do one approach from off-screen, two swipes, a beam-prepare action and a approach with the BeamOfDeath.Then we start with the swipes again. Since we hook on to damage and death-events from other components, we handle this when the events actually occur. Runaway event handlers - always clean up your events. In the script I have an array of references which I add to and always empty and unlisten in ondestroy. Be careful when calling the init function again from the script itself. You might end up with runaway event handlers. Make a separate reset function or similar instead. Do small changes in the script before saving and testing. After all - this is what this solution excels at! Also, it is easier to pinpoint errors since debugging is currently very hard. I utilize the ECS architecture by creating a set of components that can be (re)used, and more importantly - also be fetched and manipulated directly in the script. All "hard-coded" components like weapons and health are (mostly) stand-alone, and do not know much about other components. There are some exceptions, but I try to have other components as explicit dependencies and not implicit ones. As an example: in BossWeapons, I have a function run_hull_collision(hull:EntityHull, ?_remove_on_hit : Bool = false) : Bool. This takes an argument of another component (EntityHull). -But they do not do internal calls to fetch components directly from entity via the get method. At first I didn't add a update function since I also wanted to challenge myself by making a pure event-based architecture. So for the Boss I have been relying on creating a sequence helper which is very basic, and handle all other logic using only events and tweening. This works fairly well in my opinion, but depends on how complex your behavior is in the end. A side-note here is that I save all the event-id's for the registered in an array. This makes the cleanup job much easier and more reliable. The only downside of an event-based and callback-heavy architecture is that it is a lot harder to debug as mentioned previously. Later, I decided to add the player as a script as well, just for fun! I quickly realized that I would need the update loop to handle some of the logic, so I also support this. The function is optional and no calls are attempted at all if it doesn't exist. The general scripting classes make no assumptions of what you're trying to do and should be independent. To make additional classes available for the script to use, you can add custom files for imports, like ScriptClassLibraryLuxe. I set out to create a simple example since I have never coded this kind of behavior like this before. So I had to make a more complete example to also test if this was something that I could work with. Sorry for the bloat, but I hope you also agree on some of the overall, architecural patterns :) I found myself enjoying the opportunity to do a very fast reload, and I will atually consider using this in the future. Currently there are very few limits that cannot be overcome in my opinion. I deemed this as a useful exercise that hopefully others can learn from! Add compiler flag for conditionally compiling scripts as normal luxe Components (needs some modifications and possibly path tricks). 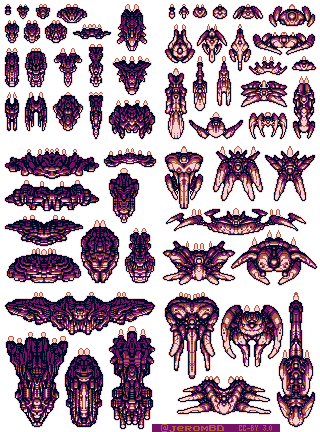 The ship sprites and bullet sprite are by @JeromBD and released under CC-BY-SA 3.0 (c) 2011 JeromBD from opengameart.org. They are slightly modified.